Folklore tells us that March comes in like a lion and goes out like a lamb. While March is meteorologically a spring month, here in New England and other mid-latitude locations throughout America, it is still cold and snowy when it commences and much milder and rainy at month’s end. Hence the comparison to the ferocity of a lion and the tranquility of a lamb. However, this explanation, attributed to the early American Colonists, is not globally applicable. We must turn to astronomy for a more inclusive answer. It’s really quite simple. When March begins, the constellation Leo the lion is rising above the eastern horizon just after sunset, and at month’s end Aries the ram can be found setting below the western horizon at sunset. This sky clockwork has not appreciably changed for thousands of years. Our ancestors observed the appearance of these star patterns and ascribed significance to their seasonal arrival and departure in the sky. Most everyone links the weather with seasonal changes. However, through my decades of public outreach and teaching astronomy, I know many folks are misinformed as to the reason for the season(s). Some individuals believe the northern hemisphere summer is hot because the Earth is closest (perihelion) to the Sun at that point in its orbit. Quite the opposite is true. Earth is at perihelion (approximately 91,000,000 miles) in early January, while farthest (aphelion) from the Sun at the beginning of July (approximately 94,000,000 miles). Even this three million mile difference has little effect on the Earth and its environment. The seasonal changes are the result of the Earth’s axial tilt as it orbits the Sun. As the month of March begins, those of you who are early risers will notice a beautiful sight in the eastern sky before dawn. On the 1st brilliant Venus will be about ten degrees above the horizon. About 15 degrees to the upper right of Venus you’ll see Saturn, and two and a half degrees to the upper right of Saturn be a very thin waning crescent Moon. Twenty degrees farther in the same direction you’ll find bright Jupiter. These astronomical bodies appear along this linear arc because it is the ecliptic (the path of the Sun though our sky and the plane of the solar system). This stunning sky scene will be an excellent photo opportunity, so I encourage anyone to capture it. Everyone with an interest in astronomy probably has a favorite constellation. It may be because of the star pattern’s mythology, its shape in the sky, or for the beautiful objects that reside within its boundaries. While the months of March, April and May are meteorologically spring months, an astronomer can still observe many of the sky’s prominent winter constellations early in the season. What’s more is that the temperatures outside may be more moderate. One of my favorite constellations is the most prominent star pattern in the winter sky—Orion, the mighty hunter. However, on March 1 this large constellation, 26th in size, can easily be found about halfway above the southern horizon after sunset. ―Carl Barus, Report of the Professor of Physics. Annual Report of the President to the Corporation of Brown University, June 18, 1896. The masonry pier that supports the Ladd Observatory’s main telescope contains two clock vaults. These are very small rooms (4 by 4 feet square inside) that contain precision pendulum timepieces called regulators. The purpose of a clock vault is to provide a vibration-free and temperature-stable environment for exact timekeeping. The main clock vault is located in the entrance foyer on the first floor of the Observatory. The basement level vault has not been used in many years. Professor Winslow Upton calibrated the regulators using observations of stars starting in the 1890s. A regulator made by Robert Molyneux in London during the 1850s can be seen inside the main vault on the first floor. The double doors to the vault seal out drafts and have windows through which the regulators can be observed without disturbing the environment inside. The brick walls are two feet thick which provides insulation to prevent fluctuating temperatures which could cause inaccuracy. There are telegraph wires to send time signals from the regulators to other locations around Rhode Island. Starting September 12, 1893 and continuing until as late as 1973 the Observatory also transmitted time signals to City of Providence fire stations. Every day at noon and 8:30 p.m. signals sounded on the fire-alarm bells allowing residents and businesses to set their clocks to the correct time. Public time signaling was a common practice during this era. ―Frederick Slocum, The Study of Solar Prominences. Popular Astronomy, July 12, 1912. 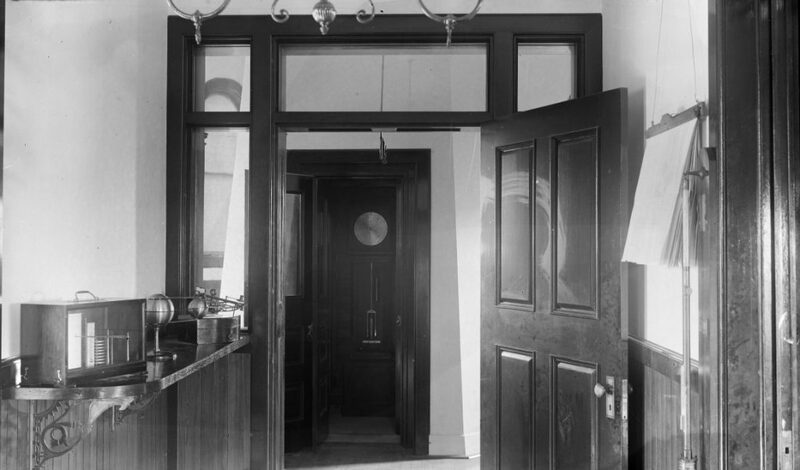 Frederick Slocum (Brown University undergraduate class of 1895) received the first Ph.D. in astronomy at Brown in 1898 and served as assistant professor of astronomy from 1899 to 1909. He then became professor of astronomy at Wesleyan University in 1914 where he planned and supervised the construction of Van Vleck Observatory. 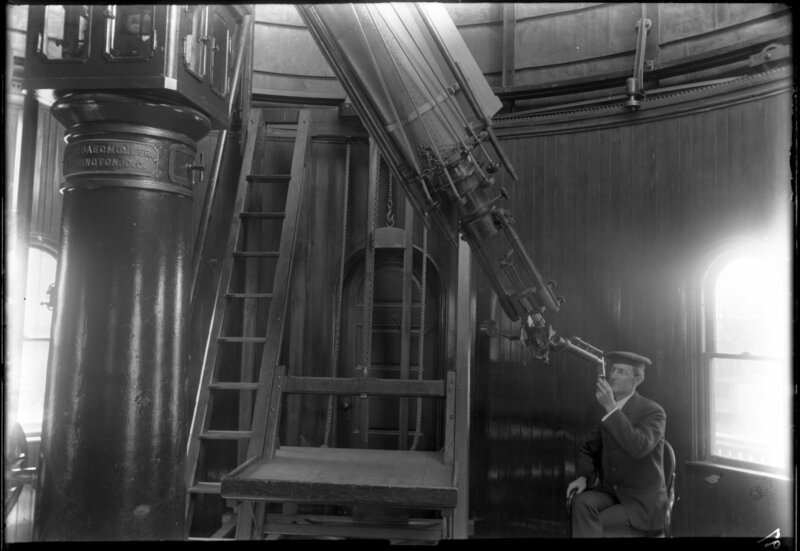 The image below shows Slocum observing with a spectroscope attached to the main telescope at Ladd Observatory. Observer Frederick Slocum using a spectroscope on the 12″ refractor at Ladd Observatory. March 15, 1905. This spectroscope was made by the scientific instrument maker John Brashear of Pittsburgh in 1891. It is used to study the spectrum of colors in starlight. It could also be mounted on a table top to examine the spectrum of a chemical which is done to calibrate the instrument. During this era professor Winslow Upton used it in an attempt to predict rain. It uses a prism or diffraction grating to disperse the light into a rainbow pattern of colors. This reveals dark Fraunhofer lines in the spectrum that can be used to identify the chemical elements present in the Sun or a distant star. Each chemical element has a unique pattern of these dark lines where specific colors are missing.